SIGforum.com Main Page CCW Methods & Issues Carry at home? I don't. I do have a loaded pistol in a safe on each floor, though. What good ate they in safe unless it is one of those on number unlocks? If it's not on me it is within reach. Originally posted by Combat Vet:What good ate they in safe unless it is one of those on number unlocks? Not as good as on body. Better than unloaded and locked up on another floor. Much better than no gun at all. Combined with heavy exterior doors that are always locked, I'm comfortable with my access during the day. At night, one is out of the safe and at my bedside within reach. Absolutely. Since I retired, 4 years ago, if I have pants on, I'm carrying. If we go out, it's a 239, or a 2009, or sometimes a K9, but when I'm home, my LCP is always with me. I have it in a Robert Mika pocket holster. He makes them out of a synthetic material that doesn't absorb moisture. I sweat like 3 people, but I have it on me when I'm washing the truck, mowing the yard, trimming trees, shoveling snow, or watching TV. Doesn't make any difference if the temperature is 110, or 0. Every month or two I clean it, and blow out the pocket lint. I've taken it to the range, when it's all fuzzy, and it's never failed. Quite a bit of the finish is worn off the slide, and there are some shiny spots on the frame, but no rust at all. Eezox is all I use on it. I've never felt like I needed to worry, but there's no reason not to carry it. I'd hate to walk into the house, after mowing the back yard, and be met at the door by someone I don't know. At that point, guns hidden all over the house are pretty much useless. Not in the shower or while sleeping. I feel so normal here - I always have one on me. Pico or LCR - Watching TV is sometimes a nice time to fondle the newest pistol. My wife just leaves me alone. Life is good. I agree wholeheartedly with GrumpyBiker. I am carrying only when I have my pants on. Admittedly, I don't carry enough while at home and I believe that I should do it a whole lot more. I fall into this false sense of security and think that there is a gun close by that I should be fine. It's laziness. I just hope that it doesn't turn into real regret. I have lived in the same house for 36 years, I've never felt scared or worried even once. However, if I am dressed I am carrying. I have started. After a few forced entry break ins around me, my pistol stays with me all the time. The break ins have been apartment buildings but it's getting closer to me. The heroin problem around me has got bad and I'm pretty sure that has a lot to do with it. There have been some videos of armed people going up and ringing doorbells. A certain one got a video and then lights came on. The 2 guys ran luckily. This was in an upscale neighborhood outside of the city. Like some, I get up and holster my 320c, spare mag,knife, and flashlight, but continue to keep all on until I go to bed. With a good holster and belt I'm very comfortable. 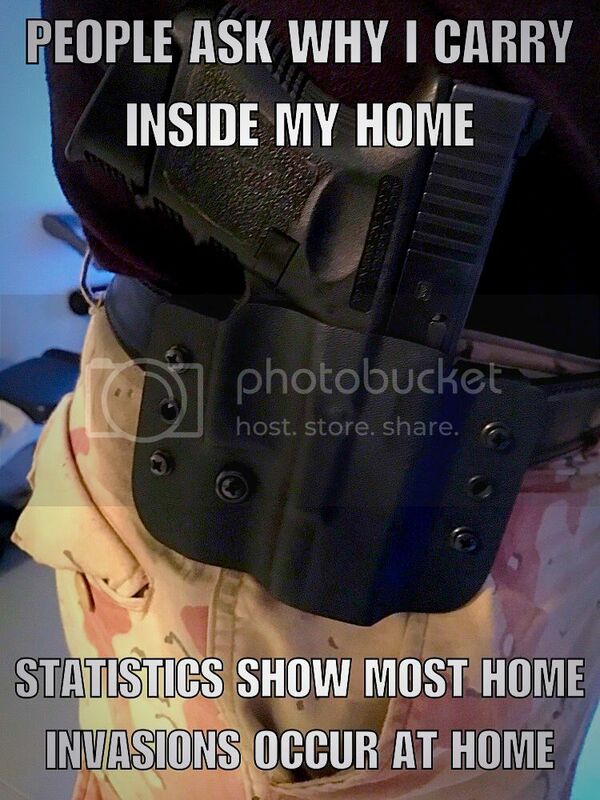 I live a good area but bad guys come to good areas to commit crimes and one may not have time to get to a firearm and light if one's door is kicked in during a home evasion etc. I have a firearm "at hand" 24/7 no matter if I am at home or away. I always have a S&W M60 snubbie in my pants (if I am wearing pants), within 6 inches of my head if I am sleeping, and have either it or a Beretta 92FS within reach if I am out of my pants. I have been so armed for the past fifteen years. Either on my hip or within reach. Quick Reply to: Carry at home?